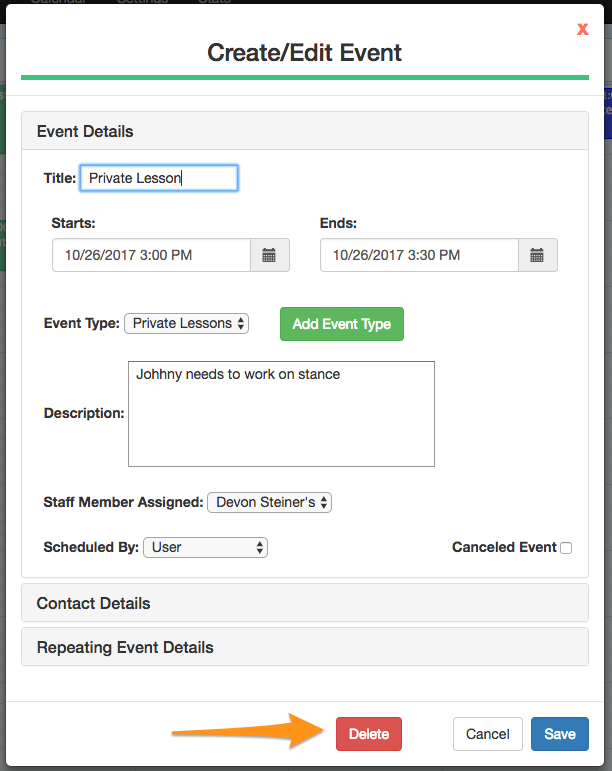 This article is going to show you how to edit and delete appointments on your Appointment Book. To edit an appointment on your Appointment Book you will click once on the appointment you are wanting to make adjustments to, so it will bring all the information from that appointment up. You can go through each section, Event Details, Contact Details, and Repeating Event Details and make changes, as necessary. Be sure to select Save at the bottom, so it will save all your edits on the appointment. To delete an appointment, you will want to click the appointment once to bring the details up. When the event details pop up, click the red delete button at the bottom of the appointment window. It will then ask if you are sure you want to delete the appointment. If you select Okay, the appointment will be removed from your calendar. Watch the following video on how to add, edit, and delete appointments.